To impart the knowledge of conducting, dielectric, insulating and magnetic materials and their applications. To impart the knowledge of plastics and materials for Opto - Electronic devices. 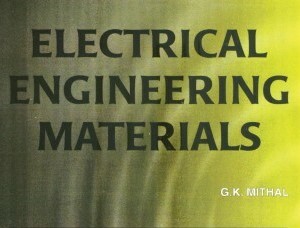 Introduction to Electrical and Electronic Materials: Importance of materials, Classification of electrical and electronic materials, Scope of electrical and electronic materials, Requirement of Engineering materials, Classification of solids on the basis of energy gap, Products – working principle and materials, Types of engineering materials, Levels of material structure. Spintronics and Spintronic materials, Ferromagnetic semiconductors, Left handed materials. Revised Bloom’s Taxonomy Level L1 – Remembering, L2 – Understanding. Conductive Mat erials and Applications: Introduction, Types of conducting materials, Low resistivity materi als, High resistivity materials, Contact materials, Fusible materials, Filament materials, Carbon as filamentary and brush material, Material for conductors, cables, wires, solder, sheathing and sea ling. Insulating Mate rials: Insulating materials and applications – Ceramic, Mica, Porcelain, Glass, Micanite and Gla ss bonded mica. Polymeric materials – Bakelite, Polyethylene. Natural and synthetic rubber. Paper. Choice of solid insulating material for different applications, Liquid insulating materi als – Requirements, Transformer oil, Bubble theory, Aging of mineral insulating oils. Gaseous ins ulating Materials – Air, Nitrogen, Vacuum. Magnetic Mater ials: Origin of permanent magnetic dipole, Magnetic terminology, Relation between relative permeabi lity and magnetic susceptibility. Classification of magnetic materials, Diamagnetic, Paramagnetism, Ferromagnetism, Ant ferromagnetism and the corresponding materials. Magnetic Materials (continued):Types of magnetic materials, Soft and hard magnetic materials, High energy magnetic materials, magnetostriction. Plastics: Introduction, Thermoplastics, Rubbers, Thermosets, DC and AC properties, Mechanical properties and processing of plastic.